Click here for a simple graphic on how an idea becomes a law. · Prior to 1964, the Legislature only met in odd-numbered years for a period of sixty days. · According to the South Dakota Constitution, legislators are reimbursed only 5 cents a mile for one trip to and from their homes during a legislative session. · It takes only a simple majority of the members of each house to pass the bill that funds all of state government, but it takes two-thirds of the members to pass other smaller, specific spending measures. · Representatives use an electronic voting machine to cast their votes in the House Chambers, but the Senators still rely on the Secretary of the Senate to call the roll for each vote. · Democrats have only controlled the House of Representatives once. That was in 1935. The Republicans have controlled it at all other times except in 1973, when the Democrats and Republicans had a tie with 35 members each. South Dakota Legislator voting record chart. 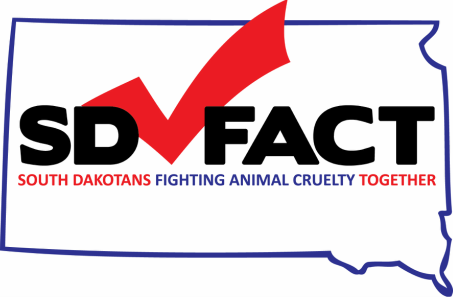 Here you’ll find information and links to humane legislation SD FACT supports and inhumane legislation SD FACT opposes along with materials and resources you can use to educate others on issues that affect animals in our state.